I brought back a big back of sauerkraut from my trip to Germany. Is that a bit sad? Other people bring back clothes, jewelry, even alcohol – but I have bags of fermented cabbage with me. I love the stuff and find the jars you can buy in supermarkets too vinegary and a pale imitation of the real thing. I intend to use some of it in a reuben sandwich later in the week (I’ll report back on how it goes). I found a recipe in Vegan Planet for goulash so I decided to give it a go. Tempeh is a very strange ingredient. It’s hardly found in this country at all, but I began to be intrigued when I saw it feature in american cookbooks. It’s fermented soya, which doesn’t sound very nice, and indeed it does take a bit of getting used to. I buy it in jars as it’s the only way I can get hold of it. I’ve tried it a few ways at home and so far the only time I’ve really liked it was in tempeh bacon and bolognese. I must try some more grilled versions of it. I’ve enjoyed it in restaurants in diners and restaurants in America but if it isn’t done well it can have a very strange pungent taste that’s quite difficult to describe. I’ve sold that well haven’t I? If you can’t get tempeh you could use any kind of meat alternative chunks, or even mushrooms would probably work. 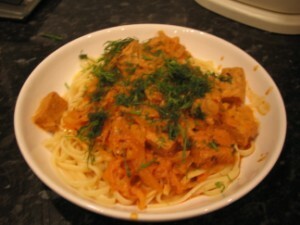 This goulash was based on sauerkraut and tempeh, with caraway seeds, tomato puree and a few other things. It suggested serving it with flat noodles but I didn’t have any in so I used linguini. We both really liked it and thought that the tempeh and sauerkraut worked very well together – maybe because they’re both fermented? I even think that jarred sauerkraut might work too, so I don’t need to wait to stuff my rucksack full of it next time! (By the way, I looked in Vegetarian Meat and Potatoes, by the same author, and there’s a very similar recipe there but it has carrots in it too which I think would work well and give some extra vitamins too). This entry was posted in Vegan Planet, Vegetarian Meat and Potatoes by efcliz. Bookmark the permalink.